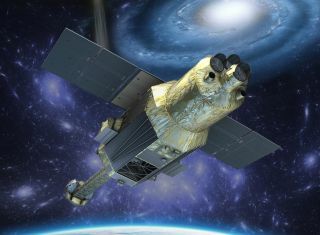 An artist's illustration of the Hitomi X-ray astronomy satellite in orbit. SALT LAKE CITY — Japan's troubled Hitomi satellite managed to collect some science data before going silent last month, scientists said. Officials haven't heard from the Hitomi X-ray astronomy satellite since late March, about six weeks after the satellite's launch, and the craft appears to have broken into several pieces. But Hitomi did manage to complete two scientific measurements before the trouble hit, said Ann Hornschemeier, a scientist at NASA's Goddard Space Flight Center in Greenbelt, Maryland. "I am aware of the situation right now with Hitomi," Hornschemeier said here Sunday (April 17), during a session at the American Physical Society's April Meeting. "However, it did gather science data. There are science-data activities going on right now. At NASA, we're still carrying it as an operating mission." Ralph Kraft, an astrophysicist at the Harvard-Smithsonian Center for Astrophysics in Massachusetts, also spoke briefly about the Hitomi results during his presentation in the same session, which focused on NASA's Physics of the Cosmos program. Facts about Hitomi, the JAXA satellite that fell silent shortly after orbiting Earth in early 2016. See our full infographic about Japan's Hitomi X-ray astronomy satellite here. "Hitomi actually made two observations, science-calibration observations," Kraft said. "One was of the Crab Nebula; one was of the Perseus cluster." Kraft clarified that Hitomi managed to take spectroscopic data of these two objects. Spectroscopy allows scientists to study the chemical and atomic properties of a source, based on the light that the source emits. Kraft is not working on the Hitomi science analysis himself. However, he said he has seen preliminary results from that analysis, which he said are not yet public. Kraft indicated that the results had been submitted for publication. Hitomi, also known as ASTRO-H, launched to Earth orbit on Feb. 17. The satellite is equipped with instruments to observe the sky in both X-ray and gamma-ray wavelengths; its planned observations were intended to help scientists study dark matter distribution in the universe, the evolution and large-scale structure of the universe, black holes and other extreme states of matter, and many other phenomena. It's unclear what exactly happened to Hitomi. The Japan Aerospace Exploration Agency (JAXA) said it hasn't given up hope on saving the satellite, but the long silence and the apparent breakup of the probe are obviously not good news. "This is a real tragedy for our community that Hitomi is having problems," Kraft said.